There are several different variation for a server's URL. For example, a client running backup could use any of the following variations pointing to the same server. Often administrators use HTTP when they first start using Syncrify and change to HTTPS later on. However, in order for the clients to switch to HTTPS, someone must manually change the URL on the client's end. Starting version 3.8 of Syncrify, administrators can specify a preferred URL in Syncrify. See image below. 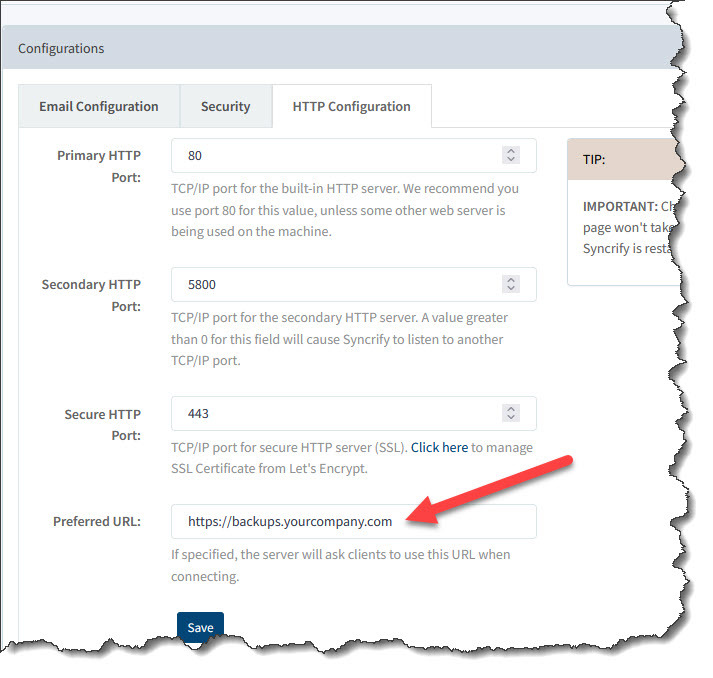 When a this value is specified, Syncrify server will send a message to every client that is connecting using a different URL. Eventually, every client will start using the new URL. NOTE: This feature only works when you are using a service-based client.